Morgan is now a sophomore in high school and has overcome so many of her reading challenges. When she opens a book today, she pulls out her reading strategies from her tool box and digs in with confidence. It’s that reading confidence that she wants to help other struggling readers gain. Morgan is active in the community, even at her young age. She volunteered with Charlotte Freedom Schools in the 2017 summer program. During her service, she helped lead a reading group of K-1 readers. Morgan showed patience, enthusiasm and a love for reading with each child. During that time, she learned about Promising Pages and its mission to collect books for children in the Charlotte area. She was immediately inspired by this program and contacted the director, Kristina Cruise. Morgan’s freshman year of high school, she started a Promising Pages Club, where she encouraged club members to join her by reading with students in the after school program. They made “magic reading carpets” with the children and helped make after school reading fun! Morgan was invited to attend one of the Promising Pages board meetings and the organization came to talk to the school club about book drives. She led her Promising Pages Club in their school’s first school-wide book drive. 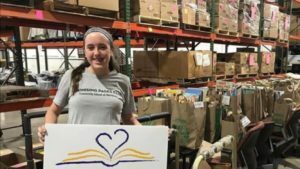 The book drive collected 4,500 books the first year! 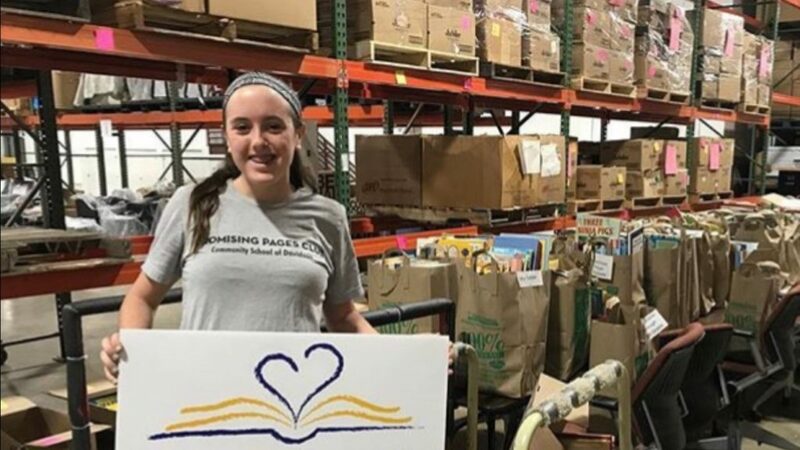 At the end of the school year, Morgan wanted her club members to experience the joy of giving books to children firsthand. She contacted Renaissance West Stem Academy. Morgan knew this was the school’s opening year and that the classroom teachers and students were in need of books. Her club organized a “Magic Book Party” for all the first grade students. They went from classroom to classroom with balloons and wrapped books for each child to open and keep. Each club member told the first graders about their favorite childhood books, and Morgan shared about her reading struggles and how she always finds a way to enjoy books. The club also set up a “Book Shop” for the teachers in the workroom with books of all levels for teachers to take for their classrooms. Morgan was amazed at the end of the school year by how much a single book could impact a child’s life in such a big way. This past summer, Morgan signed up as a YMCA reader and was assigned to her local elementary school. Again, she read individually with children helping them to find joy in summer reading. Morgan is continuing her Promising Pages Club at her high school, now in its second year. They have the same goals as last year and are adding an outreach team to bring in more books and connect with the community. Morgan is truly a reading light to young people across the county. She sees how high school students can make a difference in the lives of elementary children. Children helping children, one book at a time.